Ingredients: strawberry 85%, invert sugar syrup 15%. 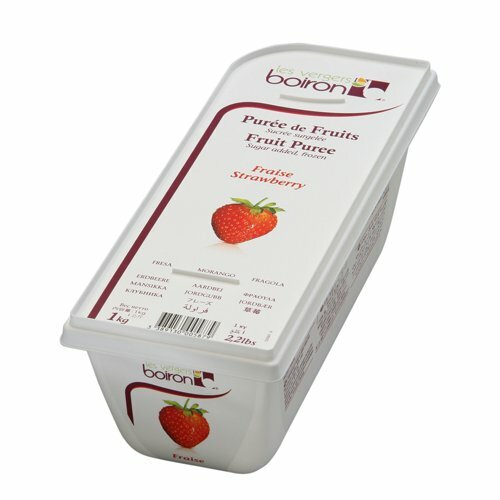 Boiron frozen fruit puree is made by crushing and refining whole fruits selected from homogeneous batches of selected varieties in order to guarantee a typical color and taste of fresh fruit. A perfected method of rapidly heating and cooling the fruit for pasteurization allows them to create flavorful and delicious puree. Les Vergers Borion frozen fruit purees are made by crushing and refining whole fruits from homogeneous batches of selected varieties in order to guarantee a taste and color of the original fruit. A perfected method of rapidly heating and cooling the fruit for pasteurization allows them to create flavorful and delicious puree. All fruits used in Boiron purees are non-genetically modified organisms (GMO free). If you have any questions about this product by Boiron, contact us by completing and submitting the form below. If you are looking for a specif part number, please include it with your message.